How we label things, or how we construct their meaning and place in history, obviously will say a lot about us. The Constitution serves as a good example. The Constitution has its flaws, its oversights, and some ungainliness about it. We understand that it’s obviously not perfect. But it surely has worked on some level, having lasted this long. Because it has worked (or at least we assume it has — more thoughts on this later), we think of it as a very “modern” and forward-looking document. This matches how we think of ourselves. We are a “progressive” people, the documents that define us must also have the same character. But in his two books Empire of Liberty, and The Idea of America acclaimed historian Gordon Wood makes the point that the Constitution tried in fact to stem the rising tide of “liberty” and change unleashed by the “spirit of ’76.” The Constitution may not have been a completely “reactionary” document but it was a response to a quick erosion in society of what many elite revolutionaries like Adams and Madison held dear. Through various quotes and citations, Wood lists the changes seen and feared by such men in the 1780’s . . .
A loosening of traditional relationships between men and women — parents had much less control over who their children married. Extreme partisan politics on local levels, with stories of violent behavior in state legislatures rampant. The rise of the “party-spirit” in politics bewildered many. At a deeper level, two other questions arise. Can the structures of organizations curtail underlying driving principles that form such organizations? I tend to side on this one with the Jurassic Park dictum, “Life finds a way.” The early “conservatives” could not call upon the spirit of self-determination in 1776 and then expect to put the toothpaste back in the tube once the Revolution had accomplished what they wanted it to. The population at large could rightly retort, “What about us?” Bowing to the “will of the people” became a necessity, and eventually, a foreordained, positive good. Even a Constitutional “literalist” or “minimalist” like Jefferson gladly dispensed with his principles with the Louisiana Purchase, among other instances. 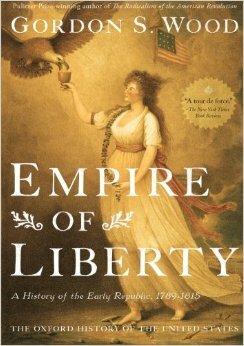 Like a nuclear blast, the concept of “liberty” leveled everything in its path. What mattered to most was not the past, but the future. The founders had done their part, but our vehement abhorrence to anything smacking of aristocracy made us quickly resistant to anything resembling the determining “tyranny of the past.” John Adams, among others, quickly tried to assert that, “Wait! That’s not what we meant!” Most responded with some form of “I don’t care!” Within a generation of the Constitution’s ratification, “egghead” professions like that of lawyer already were viewed as “elitist” by many, especially towards the frontier. The seeming radical nature of the “Jacksonian Revolution” actually had its roots laid years prior. Conceiving itself as a composite of different peoples, the British Empire could somehow accommodate the existence of Indians within its territory. But the new American Republic was different: it contained only citizens who were presumably equal with one another. Since the United States could scarcely imagine the Indians as citizens equal to all other American citizens, it had to regard Native Americans as members of foreign nations with which treaties had to be negotiated. Of course, most of the Indians themselves had no desire to become citizens of the American Republic. While the 17th century colonists did fight with Indians, little doubt exists that American Independence proved a disaster for Native Americans. Problems began years before the war itself — one of the driving issues behind the Sugar Act and Stamp Act involved keeping colonists off Native American land. Wood’s reasoning fits with de Tocqueville’s thoughts on equality, and the problem persists today. We have yet to work out the tension between liberty and equality. When the “people” speak (however we measure this) we cannot tolerate deviation from the norm. The example of Bruce/Caitlin Jenner speaks to this. How many ESPN commentator’s could keep their jobs and declare that Jenner is tragically mistaken in his actions? To be fair, had ESPN existed 50 years ago, could anyone have then applauded his actions and kept his job? 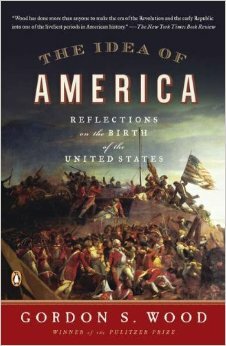 One unsaid implication of Wood’s book is pride of place between the American and French Revolutions. Most see the American Revolution as giving birth to the French Revolution, with the French Revolution as the bastardization of all that went well in America, then withering on the vine as Napoleon took over. But we might instead see the French Revolution as the real victor, with its sense of the power and authority of the “people” in more or less full swing by the early 19th century in America. He who laughs last laughs loudest. Or perhaps both of these positions wrongly presume an essential difference between the two events. Maybe the American Revolution started to resemble the French Revolution because they had the same origins — fraternal if not identical twins. If we consider this option, then we may need to reevaluate America history as a whole — an exciting if not daunting task. *We should note that those at the the Constitutional Convention had different ideas, and others whom we might consider “founders” like Patrick Henry, John Adams, and Thomas Jefferson were not at the Convention at all. **Wood cites a variety of sources to demonstrate that the traditional understanding of the need for the Constitutional Convention being the weaknesses of the Articles of Confederation are false. Many had perfect awareness of these weaknesses and their fix remained relatively simple. The real concerns of men like Madison and Washington lie rather in their observations of the petty bickering of state legislatures, and the fact any man Jack seemingly could get elected to state legislatures. As we reflected on the Scientific Revolution as a whole, we saw how people’s view of their experience in the world changed. Newton and others gave us a universe of order and balance — a somewhat reductionistic world of cause and effect. One could argue that a subtle shift occurred between the Reformation/Counter-Reformation era of the ‘inner’ man, the world of faith, etc., and a new focus on what can been seen and measured. The reign of Louis XIV in some ways embodied these new principles. Symmetry and order were key concepts of his reign, and they both were abundantly evident in the architecture of his royal residence in Versailles. Many may tend to think of absolute monarchies existing in the Medieval period, but this is far from the case. The era of absolutism might be dated between 1600-1750, and the Reformation certainly may have impacted this. With the political power of the Church as a separate entity broken, that power would have to land somewhere. For many, the most convenient and obvious place for that power to reside was in the person of the king. And, if a neat house, for example, reflects to our eye a well-run house, than the order and symmetry in the architecture surely reflected back on Louis himself. Perhaps most striking aspect of Louis’s reign, however, was how he controlled the nobility. Like many nations France’s nobles had a tumultuous relationship with the crown, with a variety of wars and compromises as the result. Louis changed the dynamic by changing methods. He created an elaborate system of ritual and custom. Violating these rules of ‘polite’ society meant ostracism, which meant loss of influence. What the nobles apparently did not notice, however, was that under Louis’s system they had no influence. Louis had them immersed in a bizarre system of etiquette. Things like discussing politics or deep questions of life were not against the law, but frowned upon. It was ‘not done.’ Thus, their lives became almost ridiculously trivial and inconsequential, with literally hours taken up in deciding who could sit where, who should stand for who, and so on. Ask your children if you are interested about some of the specifics of this etiquette involving door knocking and chair sitting, among other things. The French Revolution would reveal some of the consequences of this development. I’m not a criminal. I’m a con-man. [The difference being], I don’t take people’s money–people give me their money. There’ more than one way to skin a cat. Louis masterfully tried to have image morph into reality. Apollo, for example not only had the power to move the sun, he also was the god of music and culture. In using Apollo, Louis claimed not just preeminence of power but also of taste, a place the French have enjoyed for centuries since. Yet, for my money, while I would readily call Versailles impressive, I don’t think I would call it beautiful. Louis wanted to subtly scream “Authority!” which did, I think, create a chilling effect. Next week we will look more deeply into the policies and practices of Louis’ France. In this update I have painted perhaps too black a picture of Louis. He was certainly far from an overtly evil or cruel man. He had many endearing qualities. But the changes he began did have significant consequences.